The primary purpose of this article is to assist in locating the primary trails that were used by wagons prior to 1920. During the time period that land leases were popular, virtually all of the area occupied by the Crow Indians was opened for leasing. Additionally there was a great deal of traffic throughout the region for distribution of feed and food supplies. This created many wagon trails that to some may appear as portions of the “Bozeman Trail.” To isolate the real trails from the service supply routes, the land leases were examined. Charles Crane Bradley, Jr, who published his findings in August 1970, reviewed the source records available at Crow Agency in detail. This was an exhaustive review and encompassed the land areas and persons who had control of the districts. As time progressed from 1887 to 1918, the lease areas were changed to accommodate the needs of the tribal members. One of the main distributors of wagon supplies to the region was Paul McCormick, and he erected a large fence line crossing the reservation in a northeast direction that created Districts 3 and 4 between the South Hills and the Big Horn River. These leaseholds originally encompassed all the land, and some even allowed the livestock to graze right up to the Indian encampments and cabins. This picture came from the Bureau of Indian Affairs in Billings. It was taken before the agency moved from Absarokee to Billings in 1884. Pictured from L to R are: Wounded Arm, Blackfoot (Over-all Chief), Never Die, Shows His Face, and Onion. This picture was previously unpublished. 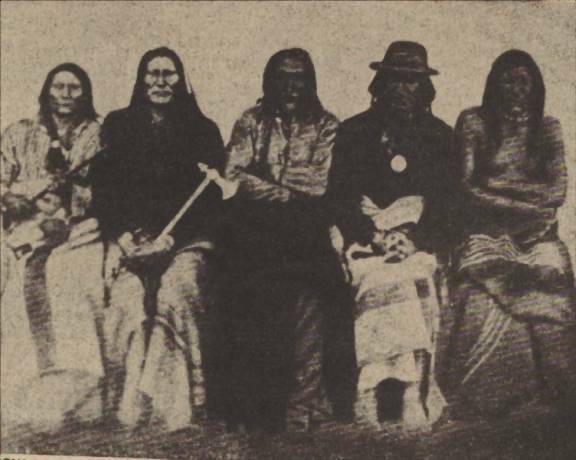 The Crow Indians visited the Billings site many years before it was seen by white-men. The junction north of where the freeway crosses the river on the east end was their annual meeting-place of this nomadic tribe. To them, the location was more commonly referred to as “Place of the Skulls.” This name was given after one of their great villages was decimated by smallpox, and they killed themselves by jumping off from sacrifice cliff. It is recorded that the Indians blind folded their ponies and rode them off the cliff. TV and radio towers are on the cliff face today. In 1883 it appeared to the local residents in Montana that the Crow Reservation land would be opened for homesteading in 1884. In the summer of 1882, Secretary Teller had met with the Crow Tribal leaders and apparently disagreed with their refusal to reduce their land holdings. In his 1883 annual report, he planned to recommend that the reservation’s size be reduced to that needed to sustain their current population. He proposed to pay them for the excess land at current value, and spending that equivalent money to provide education, supplies and farming needs. To accomplish this task, the agency would need a land office established in the area. Since the government is planning to take back much of the crow land, the question of who owns the NPR right of land grant on reservation land. The opinion is that NPR will not acquire land rights to the vast acreage they hold in odd numbered sections adjacent to the railroad track as it passes through the reservation. Even if they were granted the rights, NPR wouldn’t provide any payment to the tribes for that land. In an earlier suit, NPR lost their rights to their odd numbered sections in Bitter Root Valley. Here title could only be given to NPR if the government had full title at the time. The government does not have full title to the reservation lands, and therefore NPR cannot receive such. NPR filed their map of general route in Montana in 1872. In 1881 they filed their definite location. Before the first date the Crow Reservation lands had been set aside by definite boundaries, and the government ceased to have any title. While in this “non-ownership” state, NPR filed their land claims for the odd numbered sections, and thus only those sections that fell outside of the reservation jurisdiction would be transferred. This became a boom for settlers, since if the government were to confiscate (reduce) much of the Crow Reservation land, NPR would not have title to about one-half of the land, allowing settlers to acquire adjoining parcels of land, across both the odd and even section numbers. This would make the land more productive. · He recommended the repeal of the pre-exemption act and made suggestions for radical changes in the timberland laws. Before 1885, General Sheridan proposed that the government purchase all of the Crow Reservation for $1.00 per acre, which was agreed to by the Indians, In the 1885 congressional session a senate committee studying the matter agreed to support a bill which would open all of the reservation west of the Big Horn to white settlement. All that was required was for the Montana legislature to prepare a bill. A commission was established to investigate the matter (Dawes Commission), and Helena pushed it though. Later in 1887, when the report was made public, it was discovered that The Crow Reservation was excluded, as well as right-of-way for a railroad through the reservation. Battle over the bill caused both actions to fail. In the next session, a small bill was introduced that permitted the Indians to select which 5,000,000 acres of land could be opened for settlement; leaving the prime lands in their ownership. In 1885 a consortium of ranchers (represented through Blake & Wilson – Colorado) established a ten-year, 3,000,000-acre land lease for grazing rights on the reservation with 26 of Crow chiefs, representing 3,123 persons. The Indian Board of Trade, represented by: HH Mund, CL Tomlinson, Paul L VanCleve, and JD Matheson investigated the lease for “wrong doings.” On January 27th with permission granted by the Commissioner of Indian Affairs and the Chairman of the Senate Committee on Indian Affairs, Henry L Dawes. The Billings Board of Trade selected Paul McCormick, Jules Breuchaud, and Walter Matheson to investigate the matter. Fourteen of the chiefs testified that they were coerced into signing, and 13 of them demanded that the lease be canceled. It was canceled, thus allowing local ranchers continued access to these lands for grazing of their stock. In 1892 the government took title and opened for settlement about one-half of the remaining reservation land, some 1,800,000 acres of the Crow Reservation, which was also assigned to be part of Yellowstone County. [Speculators (mainly miners and single men) who normally drifted from place-to-place, and were expecting to make a profit on the re-sale immediately acquired Most of the land.] This land area included Red Lodge Creek, Rock Creek, Stillwater and Clark’s Fork Rivers. These streams had numerous canals added for irrigation, and by 1893 there was 76 miles of waterways. In February 1893, Senator Power and WH Norton (from Stillwater) requested that they be given the right to build a bridge across the Yellowstone River onto Indian Land, owned by a woman. On 25 June, the Secretary of Interior over-ruled the Commissioner of Indian Affairs previous ruling, and stated that the State of Montana had the right to condemn such land to benefit the state. The bridge construction was allowed to proceed. The decision was based on the governments’ ruling that until an actual “Patent” document was delivered to a landholder, all such lands were only public domain, and subject to condemnation. In 1894 the Crow Indians had created substantial amounts of land cultivation, and were self sufficient for produce, grain, corn, etc., and seed for the following year. Most of the cultivated lands were planted in Timothy and Alfalfa. The local Indians had created a substantial system of canals, using their own labor, and paid for by the government. Plans to erect a grain mill in 1895 were established. ACTS OF FIFTY–SECOND CONGRESS—FIRST SESSION, 1892. October 15, 1892. | 27 Stat., 1034. The Indians contracted with the Federal Government (information as to exactly how this occurred is not available) to place water storage reservoirs on several small creeks for future stock ponds. One of these is Willow Creek Dam located on Willow Creek, 17 miles southwest of Lodge Grass on Route 463. It is presently called Lodge Grass Storage Reservation. Constructed in 1939-1941, it was made of compacted earth, is about 100 feet high and ¼ mile across the face. The construction crews compacted the soil too densely, preventing soil movement over thermal and pressure-load stress. Cracks formed in the face. Rather than tear it down and start over, they agreed to shore it up with backfill of dirt and rocks. About 1.4 million cubic yards were added. During construction the local residents and construction crews working on the project, lived in Willow Creek Camp. (Picture from EV Dahl). The Montana BLM and Water Project Administration only acknowledge the Willow Creek Dam, located south of Helena, and carry no published record of the Willow Creek Dam and other storage sites on the Crow Reservation. Frank Heinrich, uncle to Matt Tschirgi, operated the Antler Ranch on Lease # 5 in 1884 and held it for years, until Matt took over the operation. According to Robert Yellowtail, in 1884 Nelson Story was the person who initiated the leasing operations on the Crow Reservation, and he employed Indians as employees. Other cattlemen, such as the 04, UT, FUF and others were busy grabbing up grazing rights at $.03/ per acre. In 1887, the General Allotment Act (called the Dawes Act) was passed. This allowed whites to purchase Indian land. “To each head of a family not more than one quarter-section, with an additional quantity of grazing land not exceeding one quarter-section. “To each single person over eighteen years of age not more than one-eighth of a section, with an additional quantity of grazing land not exceeding one-eighth of a section. “To each other person under eighteen years, or who may be born prior to said allotments, one-eighth of a section, with a like quantity of grazing land. “All allotments to be made with the advice of our agent, or such other persons as the Secretary of the Interior may designate for that purpose upon our selection, heads of families selecting for their minor children, and the agent making the allotment for each orphan child. The title to be acquired by us, and by all members of the Crow tribe of Indians, shall not be subject to alienation, lease , or encumbrance, either by voluntary conveyance of the grantee or his heirs or by the judgment, order, or decree of any court, nor subject to taxation of any character, but shall be and remain inalienable and not subject to taxation for the period of twenty-five years, and until such time thereafter as the President may see fit to remove the restriction, which shall be incorporated in each patent. “Second. 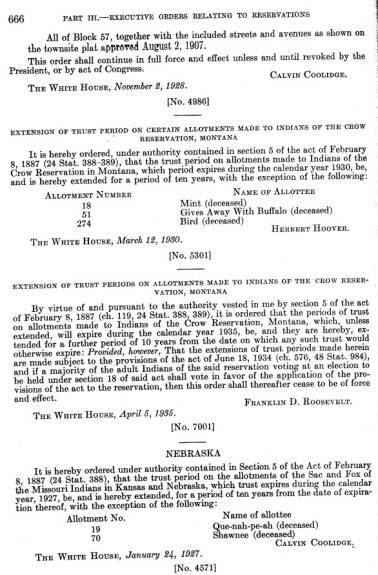 That in consideration of the session of territory to be made by us as individual Indians and heads of families of the Crow tribe to the Government of the United States, said Government of the United States, in addition to the annuities and sums for provisions and clothing stipulated and provided for in existing treaties and laws, hereby agrees to appropriate annually, for twenty-five years, the sum of thirty thousand dollars, to be expended, under the direction of the President, for our benefit, in assisting us to erect houses, to procure seeds, farming implements, and stock, or in cash, as the President may direct. “Third. That if at any time hereafter we, as a tribe, shall consent to permit cattle to be driven across our reservation or grazed thereon, the Secretary of the Interior shall fix the amount to be paid by parties so desiring to drive or graze cattle; all moneys arising from this source to be paid to us under such rules and regulations as the Secretary of the Interior may prescribe. “Fourth. That all the existing provisions of May seventh, eighteen hundred and sixty-eight, shall continue in force. Plenty Coos, his x mark. Old Crow, his x mark. Two Belly, his x mark. Long Elk, his x mark. Pretty Eagle, his x mark. Medicine Crow, his x mark. That the Secretary of the Interior be, and he is hereby, authorized to cause to be surveyed a sufficient quantity of land on the Crow Reservation to secure the settlement in severalty of said Indians as provided in said agreement, and upon the completion of said survey he shall cause allotments of land to be made to each and all of the Indians of said Crow tribe in quantity and character as mentioned and set forth in the agreement above named, and upon the approval of said allotments by the Secretary of the Interior he shall cause patents to issue to each and every allottee for the lands so allotted, with the same considerations, restrictions, and limitations mentioned therein as are provided in said agreement. For the expense of the survey of the lands as provided in the second section of this act, the sum of fifteen thousand dollars. For the first of twenty-five installments, as provided in said agreement, to be used by the Secretary of the Interior in such manner as the President may direct, the sum of thirty thousand dollars. The railroad track from the station [Billings]to the bridge over the Yellowstone is becoming a favorite promenade especially on Sundays. The track is well graded and forms a dry and pleasant walk. Stonemasons are at work dressing stone, which has been quarried from the bluffs to the rear of this town, for the Miles City schoolhouse. AW Farwell, a well-known resident of Clarks Fork and possessor of one of the finest locations on the Crow reservation, has informed us that the general feeling of the Crows regarding the proposed treaty to reduce the limits of the reservation is friendly to the reduction. This is on the understanding that the treaty contains clauses giving the Crows land in severalty and other inducements which it is generally supposed will be offered the tribe. He believes it would be judicious, in cases where Indians have already settled on land, to allow them to remain on their land and give them title to it, even if without the boundaries of the new reservation. “A new Indian reservation has been established by executive order dated Nov 26, 1884, by which 702 square miles, or 506,880 acres of land lying upon the Rosebud river and bordering upon the east line of the Crow reserve in Montana, is segregated from the public domain and set apart for use and occupancy of 600 Cheyenne Indians, This gives these Indians, per capita, 845 acres of the best agricultural grazing lands of eastern Montana, a very considerable portion of which are now possessed and improved by actual settlers, who have acquired the tracts they occupy under the government land laws. The senate committee on Indian Affairs on January 6th will begin an investigation of the leasing of lands in Indian Territory and on the Crow reservation by Indians to cattlemen. A number of prominent cattlemen and Indian chiefs will be subpoenaed to appear before the commission. One section of the revised statutes declares that Indian tribes have no authority to lease their lands. A succeeding section allows owners of herds the privilege of driving their cattle over the reservation on obtaining consent of the Indians and government. Cattlemen construe the latter section as meaning that they may lease the lands, and under this construction, nearly all the Crows Reservation in Montana, and Quapah, Cheyenne, and Arapahoe Reservations in the Indian Territory have been leased for a period of from five to ten years at from two to twelve cents per acre per annum. In the Cherokee strip, also in the Indian Territory, nine cattlemen have exclusive control of 60,000,000 acres at an annual rental of $10,000. The object of the investigation is to enable congress to take intelligent action on the subject if additional legislation is deemed necessary. Secretary Teller has written a long letter to the chairman of the senate committee on Indian Affairs upon the subject of leases of Indian lands. He says in part that the Interior Department has for years recognized the right of Indians to receive compensation for pasturage of stock on their reservations, and that such right has also been recognized by the courts and the land occupied by the Indians. The secretary says they did attempt to make leases, but the department refused to recognize them beyond treating them as licenses and receivable by the Indians at will. No one can question their right to make such a disposition of the grass growing on their lands as they have made. Concerning the pecuniary gain which the Indians now derive from licenses to use the products of their lands, which they grant to the whites, the secretary says they are now receiving $50 for every dollar received under the old system. With respect to allowing the Indians to control large and valuable tracts suitable for agricultural purposes, the secretary concludes they should not be permitted to own such tracts to the exclusion of settlers when such lands are not needed by the Indians, and that it is a misfortune to any country to have its lands held in a large quantity by a few owners, the more so if held by owners who neither make use of it themselves nor allow others to do so. “Their views do not entirely agree, Gen. Miles being more sanguine than Gen. Sheridan as to the brevity of the time within which the Indians will become self-supporting. The Lieutenant General also pointedly disapproves of Gen. Miles= plan for promptly throwing open the Indian Territory to settlement. He has, however, a project of his own for purchasing the surplus land in all-Indian reservations, which is worth consideration. His formal recommendation on this subject merely paraphrases the language used by him in conversation, as reported in the Sun a week ago. He would give to each family of a tribe of Indians the 320 acres now provided by law in case of actual settlement, and place the family on this plot. Then he would have the Government condemn and buy all the rest of the reservation, good and bad, at the average price of $1.25 per acre. The proceeds should be invested in Government bonds held in trust by the Interior Department, the Indians receiving annually the whole of the interest. This scheme is among the best of those, which are based on awarding to Indians homesteads in severalty under individual deeds. It might require modification in detail. For example, there is no reason for leaving the Indians wholly without land owned in common. A community of the white race has, besides its individual lots of real estate, large reserves for common enjoyment or for future sale. The Indians, with roaming tendencies greater than the white men, and all their traditions and instincts in favor of holding the soil in common, should apparently be permitted to have such a reserve. Nevertheless, after setting aside a liberal number of acres for this purpose, in each case proportioned to the number of the tribe, there would be still left an enormous surplus of unused lands on most reservations. It has long been evident that the Indians cannot always hold their great reservations without making some use of them. Employing Gen. Sheridan=s illustration, in the Crow reservation there are 4,800,000 acres and but 3,200 or 3,300 Indians. This allows an average of about 1,500 acres for every man, woman, and child. The Cheyennes and Arapahoes have 4,300,00 acres; the Utes, 5,100,000. The surplus of unused lands has been the origin of the grass leases that have given so much trouble and the real reason why the Indian Office connived at these leases doubtless was that instead of seeing the Indian grazing lands going to waste generation after generation, it seemed wiser to have them doing some good, not only fattening thousands of cattle and enriching the stockmen, but producing $50,000 or $60,000 a year, in some instances, for the tribe giving the leases. The wrong done by the Government officials was in conniving at violations of the law forbidding such conveyances. But had the Interior Department gone to congress with a comprehensive, statesmanlike policy, explaining that the original prohibition of Indian leases was made under a different condition of settlement and of industrial interests at the West from that which now exists, congress might have modified the law. Instead of doing this, the Government allowed private lessees and cattle corporations to unlawfully drive their bargains with the Indians for grazing privileges, whereas under any system of leasing the Government should not vacate its position and responsibilities, as guardians of the red men, but should superintend their important business transactions. Indeed, the best imaginable policy would be that in which the Government should manage the surplus real estate of the red men as a faithful guardian does that of his ward, getting the best immediate income out of it, and holding it for him until he is competent to handle it for himself. “The occupation by the Crows of such a vast acreage of land as was embraced within the confines of their reservation undoubtedly excited the envy of the white men of that day” These and other caustic comments were but a preliminary to the many demands that followed for the Indians to give up their lands and to allow widespread leasing to the white stockmen. Takes a Wrinkle, Big Ox, Big Snake, White Mouth, Broke a Horse’s Leg, Bob Tail Crow, Medicine Crow and Spotted Horse all spoke endorsing the remarks made by the higher chiefs. Senator Power contacted the Secretary of the Interior regarding who had jurisdiction over the Indian Lands. On June 25th he stated “that the state of Montana has the right to condemn, under proper procedures, for public purposes lands embraced in the Indian allotments.” This action permitted the residents of Stillwater to construct a bridge over the Yellowstone River. Authorizes the use of annuity money for the completion of the irrigation system, the distribution of the “common herd” of cattle (see act of March 3, 1891, supra), and of money arising from sales of stock is directed by the act of May 27, 1902, chapter 888 (post, p. 754). Chapter 1624; Apr. 27, 1904.[H. R. 11676.] | [Public, No. 183.] 33 Stat., 352. An act to ratify and amend an agreement with the Indians of the Crow Reservation in Montana, and making appropriations to carry the same into effect. ARTICLE I. That the said Indians of the Crow Reservation do hereby cede, grant, and relinquish to the United States all right, title, and interest which they may have to the lands embraced within and bounded by the following described lines: Beginning at the northeast corner of the said Crow Indian Reservation; thence running due south to a point lying due east of the northeast corner of the Fort Custer Military Reservation; thence running due west to the northwest corner of said Fort Custer Military Reservation; thence due south to the southwest corner of said Fort Custer Military Reservation; thence due west to the intersection of the line between sections ten and eleven, township two south, range twenty-eight east of the principal meridian of Montana; thence due north to the intersection of the Montana base line; thence due west to the intersection of the western boundary of the Crow Indian Reservation; thence in a northeasterly direction, following the present boundary of said reservation to point of beginning. Ninety thousand dollars, or so much thereof as may be necessary shall be expended under the direction of the Secretary of the Interior in the extension and completion, including the necessary laterals of the system of irrigation now being constructed on said reservation. Ten thousand dollars shall be expended under the direction of the Secretary of the Interior in the building, extension, or completion of individual Indian ditches: Provided, That none of the above sum shall be expended without the knowledge and consent of the Indian agent. One hundred thousand dollars shall be placed in the Treasury of the United States to the credit of the Crow Indians as a trust fund, the same to remain in the Treasury for fifteen years, and shall draw interest at the rate of four per cent per annum, said interest to be expended by the Secretary of the Interior in maintaining and managing said irrigation system. Provided further, That at the expiration of the fifteen years above mentioned such disposition shall be made of said fund as the Indians, with the consent of the Secretary of the Interior, may determine. Additional amounts may be expended for cattle from time to time at the request of the Indians under the direction of the Secretary of the Interior. Provided further, That during the year 1902 all cattle owned at that time in common by the Crow tribe of Indians shall be divided equally between said Indians, share and share alike to every man, woman, and child having rights upon the Crow Reservation. Fifteen thousand dollars shall be spent in the purchase of jackasses or stallions, either or both, in the discretion of the Secretary of the Interior, the same to be placed upon the Crow Reservation for the benefit of the Crow Indians. Forty thousand dollars shall be expended under the direction of the Secretary of the Interior in the purchase of two-year-old ewes, the same to be placed upon the Crow Reservation for the benefit of the Crow Indians. Forty thousand dollars, or as much thereof as may be necessary, shall be expended by the Secretary of the Interior in fencing the Crow Reservation, said fence to be built of six strands of galvanized barbed cattle wire, with either cedar posts not less than four inches in diameter at the small end or iron posts set sixteen feet apart with three metallic stays between each two posts; said fence to be well built and properly braced and anchored. One hundred thousand dollars, or as much thereof as may be necessary, shall be expended by the Secretary of the Interior in the erection, purchase and repair of such school buildings as he may deem necessary. Ten thousand dollars shall be expended by the Secretary of the Interior, in the erection and furnishing of a hospital at the agency for the benefit of the Crow Indians. Fifty thousand dollars shall be placed in the Treasury of the United States to the credit of the Crow tribe of Indians as a trust fund, and shall bear interest at the rate of four per cent per annum; said interest to be used, under direction of the Secretary of the Interior, to cover necessary expenses of maintaining said hospital. Fifty thousand dollars shall be deposited in the Treasury of the United States to the credit of the Crow tribe of Indians, the same to be expended for their benefit from time to time by the Secretary of the Interior, in such manner as he may direct. Three thousand dollars, or as much thereof as may be necessary, is hereby appropriated and set apart to pay the expenses of ten Crow Indians, two interpreters and the agent to visit Washington at such time as permission is received from the Secretary of the Interior. The balance of the principal sum due the Crow Indians under this agreement shall be placed in the Treasury of the United States to their credit as a trust fund and shall bear interest at the rate of four per cent per annum; said interest to be added annually to the principal and an annual annuity payment of twelve dollars per capita shall be paid, in cash, to every man, woman and child having rights upon the reservation; said annuity to be paid semiannually in accordance with such rules and regulations as the Secretary of the Interior may prescribe. Provided further, That two hundred thousand dollars of the last named sum may be expended in the further purchase of cattle or sheep should a majority of the Indians so decide, and the same be approved by the Secretary of the Interior. Provided further, That when each object for which a specific appropriation has been made in this agreement shall have been fully carried out and completed then the balance remaining of said appropriation may be expended for the benefit of the Crow tribe or placed to their credit in such manner as the Secretary of the Interior may determine. It is further agreed that in the construction of ditches, dams, canals and fences that no contract shall be awarded; nor employment given to other than Crow Indians, or whites intermarried with them, except that any Indian employed in construction may hire white men to work for him if he so desires. Provided further, That nothing herein contained shall be construed to prevent the employment of such engineers or other skilled employees, or to prevent the employment of white labor where it is impracticable for the Crows to perform the same. None of the money due to the said Indians under this agreement shall be subject to the payment of any claims, judgments, [or] demands against said Indians for damages or depredations claimed to have been committed prior to the signing of this agreement. ARTICLE III. All lands upon that portion of the reservation hereby granted, ceded and relinquished which have, prior to the date of this agreement been allotted in serveralty to Indians of the Crow tribe shall be reserved for said Indians, or where any Indians have homes on such lands they shall not be removed therefrom without their consent, and those not allotted may receive allotments on the lands they now occupy. But in case any prefer to move they may select land elsewhere on that portion of said reservation not hereby ceded granted or relinquished, and not occupied by any other Indians, and should they decide not to move their improvements, then the same may be sold for their benefit, said sale to be approved by the Secretary of the Interior, and the cash proceeds shall be paid to the Indian or Indians whose improvements shall be so sold. ARTICLE IV. That for the purpose of segregating the ceded lands from the diminished reservation the new boundary lines described in Article I of this agreement shall, when necessary be properly surveyed and permanently marked in a plain and substantial manner by prominent and durable monuments, the cost of said survey to be paid by the United States. ARTICLE V. The water from streams on that portion of the reservation now sold, which is necessary for irrigating on land actually cultivated, and in use, shall be reserved for the Indians now using the same so long as said Indians remain where they now live. ARTICLE VI. It is further agreed that a statement of all expenditures under the various provisions of this agreement shall be sent to the agent of the Crow Indians twice a year, or at such times as the Secretary of the Interior may direct, showing the amounts expended and the balance remaining on hand in each of the several funds. ARTICLE VII. The existing provisions of all former treaties with the Crow tribe of Indians not inconsistent with the provisions of this agreement, are hereby continued in force and effect, and all provisions thereof inconsistent herewith are hereby repealed. ARTICLE VIII. This agreement shall take effect and be in force when signed by the commissioners and a majority of the male Indians of the Crow tribe over eighteen years of age, and ratified by the Congress of the United States, and should any article in the agreement fail of confirmation by Congress, then the whole shall be null and void. Signed on the part of the United States Government by the commissioners aforesaid and by the following Indians of the Crow tribe having rights on the Crow Reservation in the State of Montana. I hereby certify that I was chosen, by the Indians to act as interpreter during the councils held to discuss the foregoing agreement; that I truly interpreted for the commissioners and for the Indians, and that they thoroughly understand the entire matter. We hereby certify that we were present at the councils held to discuss the foregoing agreement; that we understand the Crow language, and that the provisions of this agreement were correctly interpreted to the Indians, and that they understood the entire matter. CROW AGENCY, Mont., August 14, 1899. I hereby certify that three hundred and seventeen Indians constitute a majority of the male adult Indians over 18 years old residing on, or having rights upon the Crow Indian Reservation, in the State of Montana. CROW AGENCY, MONTANA, April 27, 1901. We, the undersigned members of the Crow Tribe of Indians, hereby consent and agree to the amendment of an agreement concluded with our tribe August 14th, 1899, by the addition of the following article thereto: Article IX. The right to take out water upon the diminished reservation subject to any prior claim of the Indians thereto by reason of previous appropriation, and the right to construct, maintain, and operate dams, flumes, and canals upon and across the said diminished reservation for the purpose of irrigating lands within any portion of the ceded tract, are hereby granted, such rights to be exercised by persons, companies, or corporations under such rules, regulations, and requirements as may be prescribed by the Secretary of the Interior. We certify on honor that we were present and witnessed the signing of the above agreement by the adult male members of the Crow Tribe of Indians, numbered from 1 to 526. I certify on honor that I interpreted the above amendment to the agreement, and the succeeding agreement, for the Indians and that they fully understood the conditions of the same, and that I witnessed the signing of same by the adult male members of the Crow Tribe of Indians, numbered from 1 to 526. I certify on honor that the Indians whose names are attached to the above list, numbered from one (1) to five hundred twenty-six (526) are all adult male members of the Crow Tribe of Indians, and that each one is entitled to and does receive an equal portion of the benefits of the Crow Tribe of Indians, and are entitled to signify their willingness to the above undertaking. I further certify that three hundred twenty-three (323) Indians constitute a majority of the adult male Crow Indians having rights on the Crow Indian Reservation in the State of Montana. J. E. EDWARDS, U. S. Indian Agent. “ARTICLE I. That the said Indians of the Crow Reservation do hereby cede, grant, and relinquish to the United States all right, title, and interest which they may have to the lands embraced within and bounded by the following described lines: Beginning at the northeast corner of the said Crow Indian Reservation; thence running due south to a point lying due east of the northeast corner of the Fort Custer Military Reservation; thence running due west to the northwest corner of said Fort Custer Military Reservation; thence due south to the southwest corner of said Fort Custer Military Reservation; thence due west to the intersection of the line between sections ten and eleven, township two south, range twenty-eight east of the principal meridian of Montana; thence due north to the intersection of the Montana base line; thence due west to the intersection of the western boundary of the Crow Indian Reservation; thence in a northeasterly direction, following the present boundary of said reservation to point of beginning. “Ninety thousand dollars, or so much thereof as may be necessary, shall be expended, under the direction of the Secretary of the Interior, in the extension and completion, including the necessary laterals, of the system of irrigation now being constructed on said reservation. “One hundred thousand dollars shall be placed in the Treasury of the United States to the credit of the Crow Indians as a trust fund, the same to remain in the Treasury for fifteen years and shall draw interest at the rate of four per centum per annum, said interest to be expended by the Secretary of the Interior in maintaining and managing said irrigation system: Provided further, That at the expiration of the fifteen years above mentioned such disposition shall be made of said funds as the Indians, with the consent of the Secretary of the Interior, may determine. “Two hundred and forty thousand dollars shall be expended, under the direction of the Secretary of the Interior, in the purchase of two-year-old Southern heifers, the same to be place upon the Crow Indian Reservation and added to the present herd now owned in common by the Crow Tribe of Indians. “Additional amounts may be expended for cattle from time to time, at the request of the Indians, under the direction of the Secretary of the Interior. “Fifteen thousand dollars shall be spent in the purchase of jackasses or stallions, either or both, in the discretion of the Secretary of the Interior, the same to be placed upon the Crow Reservation for the benefit of the Crow Indians. “Forty thousand dollars shall be expended under the direction of the Secretary of the Interior in the purchase of two-year-old ewes, the same to be placed upon the Crow Reservation for the benefit of the Crow Indians. “Forty thousand dollars, or as much thereof as may be necessary, shall be expended by the Secretary of the Interior in fencing the Crow Reservation, said fence to be built of six strands of galvanized barbed cattle wire, with either cedar posts not less than four inches in diameter at the small end or iron posts set sixteen feet apart, with three metallic stays between each two posts; said fence to be well built and properly braced and anchored. “One hundred thousand dollars, or as much thereof as may be necessary, shall be expended by the Secretary of the Interior in the erection, purchase, and repair of such school buildings as he may deem necessary. “Ten thousand dollars shall be expended by the Secretary of the Interior in the erection and furnishing of a hospital at the agency for the benefit of the Crow Indians. “Fifty thousand dollars shall be placed in the Treasury of the United States to the credit of the Crow tribe of Indians as a trust fund, and shall bear interest at the rate of four per centum per annum; said interest to be used, under direction of the Secretary of the Interior, to cover necessary expenses of maintaining said hospital. “Fifty thousand dollars shall be deposited in the Treasury of the United States to the credit of the Crow tribe of Indians, the same to be expended for their benefit from time to time by the Secretary of the Interior, in such manner as he may direct. “Three thousand dollars, or as much thereof as may be necessary, may be expended to pay the expenses of ten Crow Indians, two interpreters, and the agent to visit Washington at such time as permission is received from the Secretary of the Interior: Provided further, That should the funds accruing to the Indians from the sale of their lands render it advisable, the Secretary of the Interior may expend the further sum of two hundred thousand dollars in the further purchase of cattle or sheep, should a majority of the Indians so decide and the same be approved by the Secretary of the Interior: Provided further, That when each object for which a specific appropriation has been made in this agreement shall have been fully carried out and completed then the balance remaining of said appropriation may be expended for the benefit of the Crow tribe or placed to their credit in such manner as the Secretary of the Interior may determine: Provided further, That the Secretary of the Interior may, in his discretion, while the funds for the several purposes above named are accruing from the sale and disposition of the lands, make per capita cash payments from the proceeds at such times and in such amounts to every man, woman, and child, share and share alike, having tribal rights on the reservation, as he may deem for their best interests. “It is further agreed that in the construction of ditches, dams, canals, and fences no contract shall be awarded nor employment given to other than Crow Indians or whites intermarried with them, except that any Indian employed in construction may hire white men to work for him if he so desires: Provided further, That nothing herein contained shall be construed to prevent the employment of such engineers or other skilled employees, or to prevent the employment of white labor where it is impracticable for the Crows to perform the same. “That none of the money due to the said Indians under this agreement shall be subject to the payment of any claims, judgments, or demands against said Indians for damages or depredations claimed to have been committed prior to the signing of this agreement. And the various expenditures and payments required to be made under the provisions of this article shall be made as the funds therefor are available as herein provided, and shall be prorated, apportioned, and made in such proportions and amounts as in the opinion of the Secretary of the Interior the needs and requirements of the Indians and their best interests shall warrant and demand. “ ARTICLE III. All lands upon that portion of the reservation hereby granted, ceded, and relinquished which have, prior to the date of this agreement, been allotted in severalty to Indians of the Crow tribe shall be reserved for said Indians, or where any Indians have homes on such lands they shall not be removed therefrom without their consent, and those not allotted may receive allotments on the lands they now occupy. But in case any prefer to move they may select land elsewhere on that portion of said reservation not hereby ceded, granted, or relinquished, and not occupied by any other Indians, and should they decide not to move their improvements, then the same may be sold for their benefit, said sale to be approved by the Secretary of the Interior, and the cash proceeds shall be paid to the Indian or Indians whose improvements shall be so sold. “ ARTICLE IV. That for the purpose of segregating the ceded lands from the diminished reservation the new boundary lines described in Article I of this agreement shall, when necessary, be properly surveyed and permanently marked in a plain and substantial manner by prominent and durable monuments, the cost of said survey to be paid by the United States. “ ARTICLE V. The water from streams on that portion of the reservation now sold which is necessary for irrigating land actually cultivated and in use shall be reserved for the Indians now using the same so long as said. Indians remain where they now live. “ ARTICLE VI. It is further agreed that a statement of all expenditures under the various provisions of this agreement shall be sent to the agent of the Crow Indians twice a year, or at such times as the Secretary of the Interior may direct, showing the amounts expended and the balance remaining on hand in each of the several funds. “ ARTICLE VII. The existing provisions of all former treaties with the Crow tribe of Indians not inconsistent with the provisions of this agreement are hereby continued in force and effect, and all provisions thereof inconsistent herewith are hereby repealed. “ ARTICLE VIII. The right to take out water upon the diminished reservation subject to any prior claim of the Indians thereto by reason of previous appropriation, and the right to construct, maintain, and operate dams, flumes, and canals upon and across the said diminished reservation for the purpose of irrigating lands within any portion of the ceded tract are hereby granted, such rights to be exercised by persons, companies, or corporations under such rules, regulations, and requirements as may be prescribed by the Secretary of the Interior. That the said agreement be, and the same is hereby, accepted, ratified, and confirmed, as herein amended. That for the purpose of surveying and marking so much of the boundary line of the tract ceded and relinquished by the Indians as may be necessary to segregate the same from the lands reserved by them, as provided in article four of said agreement, the sum of one thousand two hundred dollars, or so much thereof as may be necessary, be, and the same is hereby, appropriated out of any money in the Treasury not otherwise appropriated, and there is hereby appropriated, out of any money in the Treasury not otherwise appropriated, the sum of forty thousand dollars, or so much thereof as may be necessary, for the completion of the survey and subdivision of said ceded lands, the same to be reimbursed out of the first moneys to be received from the sale of said lands. That the Commissioner of Indian Affairs shall cause allotments to be made, in manner and quantity as provided by existing law, of the lands occupied and cultivated by any Indians on the portion of the reservation by said agreement ceded and relinquished, as required by article three thereof; and where such Indian occupants elect to remove to the diminished reservation he shall cause a schedule to be prepared showing the names of such occupants, the descriptions of the lands, and the character of the improvements thereon. Such improvements shall then be appraised and sold under the direction of the Secretary of the Interior to the highest bidder, no sale to be for less than the appraised value, the proceeds to be paid to the respective Indian occupants as required by said article three: Provided, That the purchaser of such improvements shall have a preference right, if otherwise qualified, of thirty days after the land becomes subject to entry within which to enter the lands upon which the improvements are located, not exceeding one hundred and sixty acres, in compliance with the provisions herein governing the disposition of said ceded lands. The Secretary of the Interior shall fix a reasonable time within which such Indian occupants shall elect whether they will remain on the ceded tract or remove to the diminished reservation, and where they elect to remove he shall also fix a reasonable time within which such occupants must remove their improvements if they should choose to do so instead of having the same appraised and sold. One dollar per acre when entry is made, and the remainder in four equal annual installments, the first to be paid at the end of the second year. In addition to the price to be paid for the land, the entrymen shall pay the same fees and commissions at the time of commutation or final entry as now provided by law where the price of the land is one dollar and twenty-five cents per acre. Lands entered under the town-site and mineral-land laws shall be paid for in amount and manner as provided by said laws, but in no event at a less price than that fixed herein for such lands, if entered under the homestead laws, and in case any entryman fails to make such deferred payments, or any of them, promptly when due, all rights in and to the land covered by his or her entry shall at once cease, and any payments theretofore made shall be forfeited, and the entry shall be held for cancellation and canceled: Provided, That the lands embraced within such canceled entry shall, after cancellation of such entry, be subject to entry under the provisions of the homestead law at four dollars per acre until otherwise directed by the President, as herein provided: And provided, That nothing in this act shall prevent homestead settlers from commuting their entries under section twenty-three hundred and one, Revised Statutes, by paying for the land entered the price fixed herein, receiving credit for payments previously made, except as to lands entered under said reclamation act: And provided further, That when, in the judgment of the President, no more of the land herein ceded can be disposed of at said price, he may by proclamation, to be repeated at his discretion, sell from time to time the remaining land subject to the provisions of the homestead law or otherwise as he may deem most advantageous, at such price or prices, in such manner, upon such conditions, with such restrictions, and upon such terms as he may deem best for all the interests concerned. That the proceeds received from the sale of said lands in conformity with this act shall be paid into the Treasury of the United States, and paid to the Crow Indians or expended on their account only as provided in article two of said agreement as herein amended. Lands in lieu of occupied lands granted to Montana. No lands in sections sixteen and thirty-six now occupied, as set forth in article three of the agreement herein ratified, or withdrawn for irrigation under the provisions of said reclamation act, shall be reserved for school purposes, but the State of Montana shall be entitled to indemnity for any lands so occupied; and the governor of said State, with the approval of the Secretary of the Interior, is hereby authorized in the tract herein ceded to locate other lands not occupied or withdrawn, which shall be paid for by the United States, as herein provided, in quantity equal to the loss, and such selections shall be made prior to the opening of such lands to settlement, but no selection shall be made by the State of the lands herein ceded except to compensate for losses occurring therein. 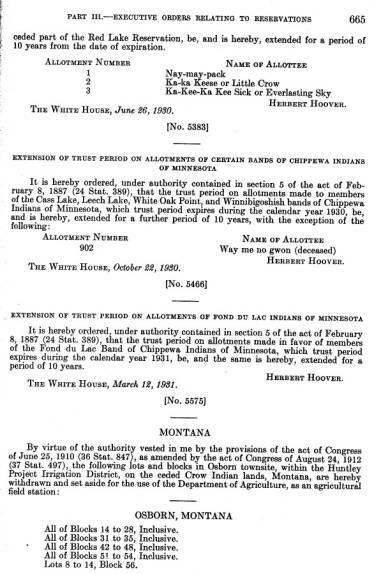 That there is hereby appropriated, out of any money in the Treasury not otherwise appropriated, the sum of ninety thousand dollars, or so much thereof as may be necessary, to pay the said Indians, at the rate of one dollar and twenty-five cents per acre, for the lands granted to the State of Montana as provided in section five of this act. That nothing in this act contained shall in any manner bind the United States to purchase any portion of the land herein described, except sections sixteen and thirty-six or the equivalent in each township, or to dispose of said land except as provided herein, or to guarantee to find purchasers for said lands or any portion thereof, it being the intention of this act that the United States shall act as trustee for said Indians to dispose of said lands and to expend and pay over the proceeds received from the sale thereof only as received, as herein provided. The Department of Interior offered 435,000 acres of Crow Reservation land for sheep grazing in District #3 [Big Horn River to McCormick’s fence at South Hills] for a five-year period. Minimum bid was $.04 per acre, and the bidder has to procure all additional feed from the Crows from the Big Horn grazing section east of the river, at current prices. Pryor District – Located on the extreme west end of the reservation 87 miles from the agency, and controlled by Chief Plenty Coups. Black Lodge District – Located immediately north of the agency and extending to the mouth of the Big Horn River, then up the Yellowstone River to Billings. Reno District – Located south of the agency and extending half-way to Lodge Grass on Sandy Creek. Its headquarters was in Garryowen. Lodge Grass District – Located south of Sandy Creek to the Wyoming border. Headquarters were in Lodge Grass. Big Horn District – Located in the Big Horn River valley to its confluence with the Little Horn River. Sec. 2. No conveyance of land by any Crow Indian shall be authorized or approved by the Secretary of the Interior to any person, company, or corporation who owns at least six hundred and forty acres of agricultural or one thousand two hundred and eighty acres of grazing land within the present boundaries of the Crow Indian Reservation, nor to any person who, with the land to be acquired by such conveyance, would become the owner of more than one thousand two hundred and eighty acres of agricultural or one thousand nine hundred and twenty acres of grazing land within said reservation. Any conveyance by any such Indian made either directly or indirectly to any such person, company, or corporation of any land within said reservation as the same now exists, whether held by trust patent or by patent in fee shall be void and the grantee accepting the same shall be guilty of a misdemeanor and be punished by a fine of not more than $5,000 or imprisonment not more than six months or by both such fine and imprisonment. For part of the cost of the construction of a road on the Crow Indian Reservation, Montana, between the towns of Hardin and Saint Xavier, to be taken from the tribal funds on deposit to the credit of said Indians in the United States $7,500, to remain available until June 30, 1929. Additionally some allotments and changes in land usages were created by Executive Order. Copyright © 1997, 1998, 1999, 2000, 2001, 2002, 2003 Web Master . All Rights Reserved. ID O’Donnell and Agnes Jones “Crow Country”, land leases, undated. The list is apparently from the lease agreement held by Chief Plenty Coups. [S. 2890.] 41 Stat., 751. Chap. 224—An Act To provide for the allotment of lands of the Crow Tribe, for the distribution of tribal funds, and for other purposes.